If like Phone Bill Casino you’re a fan of sleek and responsive gaming sites, then you’ve got to check out Quackpot Casino. You may recognise the name from the incredible Quackpot Bingo, which was launched in March 2015 and has become a rapidly successful site. It helps that they both use the well-known Cozy Games platform, so you know you can expect quality. Whether your preference is casino, table games, instant games, scratch cards and slots such as the featured favourites Fish Toons, Kitten Ball and Five Pirates then Quackpot Casino have you covered. For the high rollers out there you’ll be pleased to hear that they offer impressive jackpots, each with changing pay lines, features and ways to win, we know you’ll be entertained for hours!! With so many games on Quackpot Casino, we’re sure you’re wondering how you’ll find the time to play them all; that’s easy you can game on the go. All you need is a smart phone such as an Android, iPhone or Tablet device and you can play when and wherever you like, making those mundane chores much more exciting. With Quackpot Casino all you have to do is register and £10 bonus credit will be added to your account, no deposit required. This credit is a little welcome from the site and the perfect way for you to test drive them and their many games. 2nd deposit 100% cash match bonus between £10 and £500. 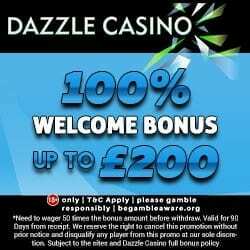 This basically means that if you add £10 on each occasion you’ll walk away with a total of £40, or if you add the maximum £500 you could receive a whopping £2,000 total; either way you’ll have plenty of extra gaming credit. Reload Bonus – The bonuses continue from your 3rd deposit onwards because Quackpot Casino will give you a reload bonus, on anything you add above £10. The percentage cash back is dependent on the amount of credit deposited, so we would always recommend that you check the promotions tab before adding anything. For the slots fans out there you’ll receive a 10% cash back on your spending every week, so even when you’re having an unlucky week you’ll still be winning. Quackpot Casino even have a weekly slots tournament providing you with an exciting opportunity to win £200 on a minimum deposit of £10. Simply play the slot games corresponding to the given promotional period, become the Slots Champion and take away the cash prize. 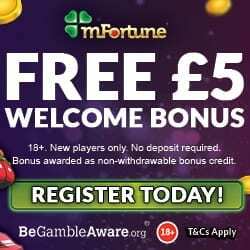 It would be cruel not to tell your mates about this great site, so why not earn a little bonus for it? For each person you refer who deposits you’ll receive a £10 Amazon voucher. 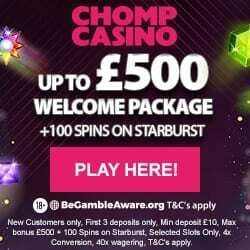 If you have any questions or issues then you can contact Quackpot Casino via email or live chat. Quackpot Casino accept the usual banking methods including Credit and Debit cards, Boku pay by phone bill, Skrill, Paysafe Card and Neteller. To register and claim your £10 bonus credit, simply visit Quackpot Casino and start playing today.